After a few months of exponential growth, the user base of Pinterest is stabilizing, meaning it’s now easier to get an idea of just who the Pinterest user is and what they are using Pinterest for. As a result, more brands have made their trek onto the social media tool, and many are using it as part of integrated marketing campaigns. After taking a look at the results these brands have seen and how they’re implementing Pinterest into their marketing mix, I have compiled a list of best practices when using Pinterest. Pinterest is a social media tool, and just like brands experience on Facebook and Twitter, there are limits and best practices guidelines when it comes to posting frequency. Many Pinterest users follow a good handful of users, meaning their Pinterest feed is often updated with new pins and thus decreasing the chance that a brand’s pins will be seen by their followers. At the same time, The noise on Pinterest is less obvious than that on Twitter, so there are times when a brand can post too much. As a general guideline, a brand should post several times throughout the day, staggering their posts daily so they aren’t posted at the same times. For example, posting everyday at 9am, 12pm, and 6pm would be a poor strategy, as you might be reaching the same people each time. Mix up the times you post to increase the chances your pins will be seen by your followers. Pinterest is all about imagery, which means the photos you pin should be interesting relative to your audience. Keep in mind the number of food, household, and craft pins that there are on Pinterest. If you post similar content, you’ll likely disappear into the mix of other posters, so make sure your pins stand out and really capture what your audience is looking for. When pinning an image, add a link to it, such as your brand’s landing page or Facebook Timeline. If you have an e-commerce store and your product is available online, pin it to the product’s page to increase the likelihood of checkout. This is really where your ROI will come into play. Though you can add prices to your pins, research has shown that users are less likely to click on your pin and share it if you put a price on it. This really goes to show you that users are on Pinterest to get ideas and share them with their friends- not necessarily purchase things. Increase this likelihood of purchase by keeping the price out of your pin and instead redirecting them to your store when they click on the image. They’ll likely still see the inspiration of the product and still be apt to purchase it as the price won’t be so direct. Capture users who are searching Pinterest for specific things. Use keywords in the description of your pins to increase the chances you’ll reach users who aren’t even following your Pinterest boards. If you’re using photos that aren’t yours, state that, and make sure they link to the original picture. Talks about copyright infringement have spread like wildfire throughout the Pinterest community, so it’s best you don’t targeted for using someone else’s photos. If you’re worried and lack a legal team, only post your content. However, don’t let the gossip steer you away from using Pinterest. Your boards and pins must make sense. Organize them according to topic. Develop a pinning strategy. You have no idea how many brands I’ve seen who have chaos on their hands because they’re pinning content at random with no purpose in mind. Make sure you have a purpose. Make your strategy stand out as well. Simply creating boards and pins isn’t enough to capture the user. Make it a conversation with your followers. Create a game or competition around your pins. Generate excitement around them. Many brands are thinking outside the box on this. 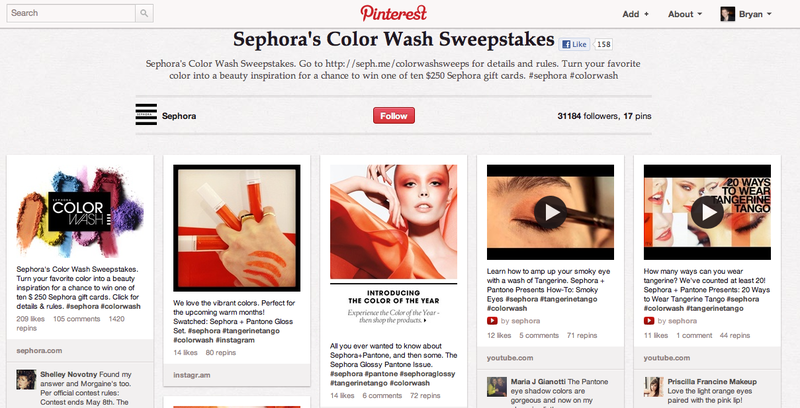 For example, Sephora created a “Color Wash” campaign where users created a board dedicated to a specific Sephora color. The user who posted the most creative idea won a$250 gift card. The content you’re creating and pinning could become viral. Increase the chance for brand recognition. Though users who repin your pin will still ink back to your original pin, some users might save your photo and upload it themselves to their Pinterest boards. Placing a logo overlay on your image will increase the chances that you’re still getting your brand name out there if this happens. Link your Pinterest profile to your other profiles and websites online. Doing so will increase the chances visitors come to your Pinterest page and begin following your pins. You can also integrate the pin button into your website. Brands like Sephora do this to allow users to pin photos of their products to their boards easily and effectively. It also ensures all photos pinned from your site link back to your site. Many don’t know this, but Pinterest isn’t just for photos. It’s also for videos. Do you have a great brand video? A how-to video? Something your followers might like? Pin it to your boards to mix up the media found on your Pinterest profile. By following these simple guidelines, you can be a successful brand on Pinterest. Since there is so much discussion about Pinterest, if you do things right, you may find yourself in the news for developing a great marketing strategy, and consequently you’ll increase your brand following. Bryan: How does a brand establish a Pinterest account? The site’s Help section isn’t much help. The current way for a brand to make an account is just to creating an account for a user and claiming the brand name as your name. Unfortunately, unlike Facebook, Pinterest currently does not have a separate account for brands (i.e. Facebook Pages). I’m guessing this will change as Pinterest releases its revenue plans. For now though, I would create your “brand” account to hold the brand name to ensure nobody else takes it (I know some brands had struggled with this on Facebook). In the future, you might be able to verify the page as a brand page, and therefore get any capabilities that Pinterest brand pages may have.